I am so close to being finished I can taste it! But today I’m going to catch up where I last left off. 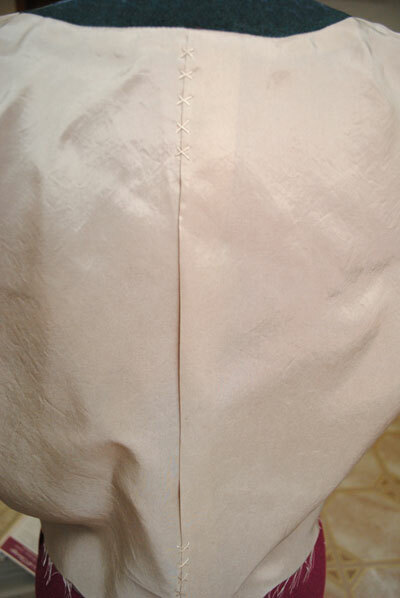 The last post was about sewing the shell, and today’s post is about the lining. This is a really long post, you’ve been warned! 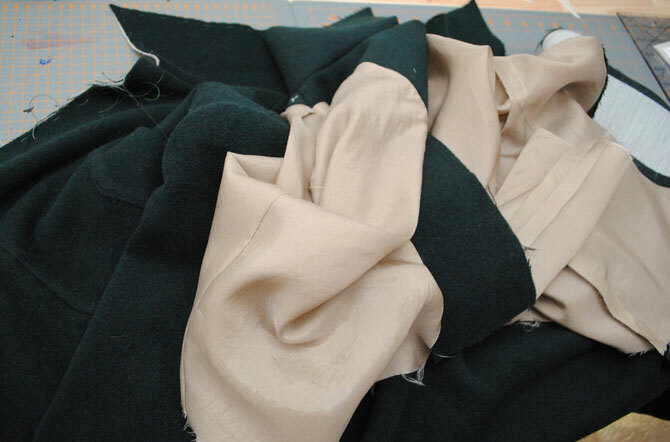 My lining fabric is rayon bemberg which is slippery beyond belief. 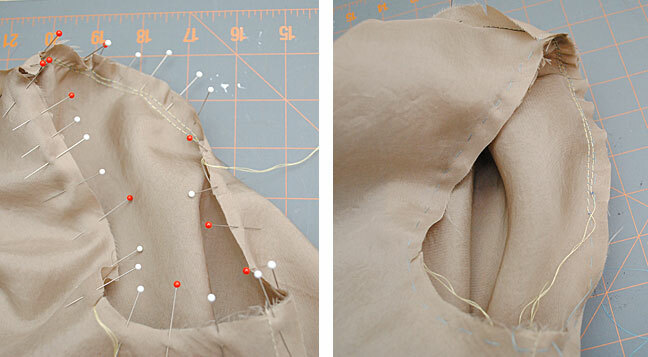 Seriously, when I explained to Mel what it was like to sew with, I did a crazy wiggle dance to visually explain. Liz was kind enough to let me borrow a fabric stabilizer to try out, which I very lightly sprayed near the raw edges of my lining. It really does help tame it a bit, as it makes it rather paper-like. (I saw Sarai mentioned it in the new Laurel companion; in fact the one pictured is the same one I borrowed from Liz.) I’d highly recommend trying it! 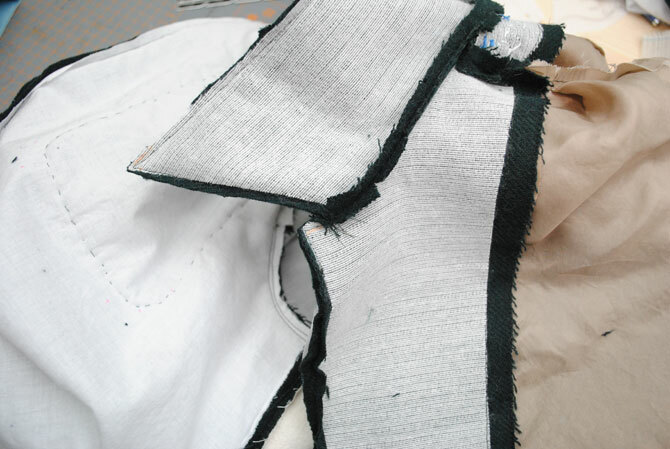 And then once both units (shell unit and lining/facing unit) are complete, you sew them together along the outside edges and up along the collar. 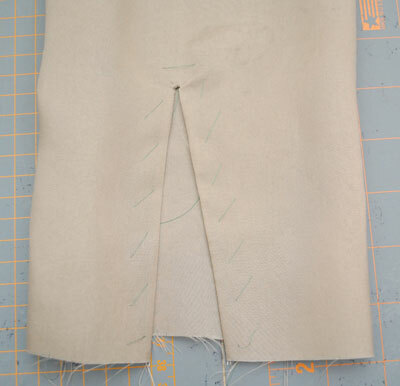 What I don’t think I mentioned is that I used separate pattern pieces that I created specifically for the lining. 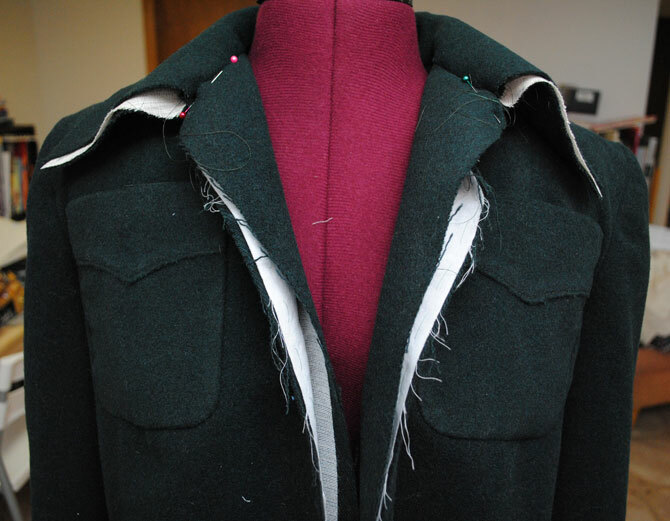 This is recommended in Jackets for Real People and a number of other places, including this tutorial from Jen at Grainline Studios. I won’t go into what I did—if you want to know, just read Jen’s post. That’s essentially what I did to tweak my lining pieces. 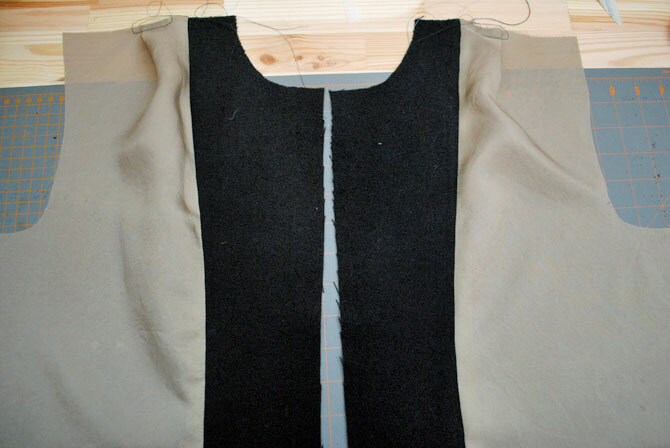 Before sewing the back neck facing to the back, there was a little work to be done. 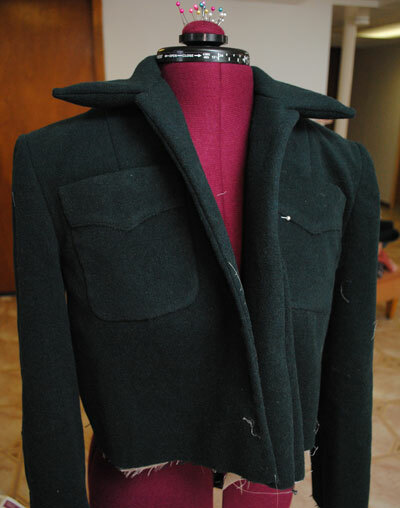 In a tailored jacket, the back lining piece has 2″ of extra fabric at center back folded into a 1″ pleat for wearing ease, and it’s tacked down at the top and bottom for a couple of inches (and if it’s a longer jacket or shaped at the waist, I think usually at the waist, too). Usually these days that’s done by machine. 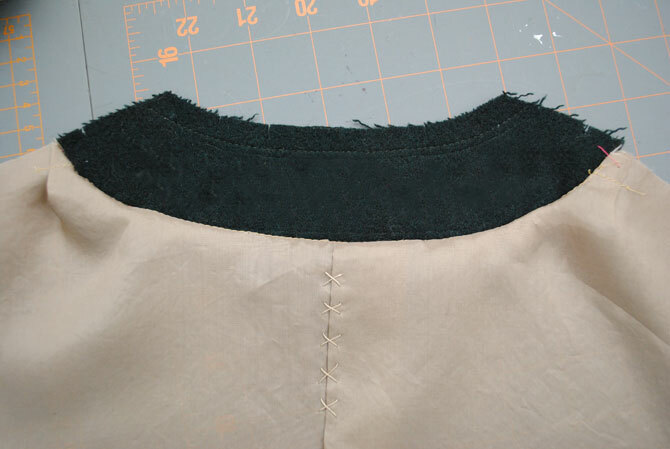 And stay stitched across the neckline. Then I cross stitched for a bit of embellishment, using silk buttonhole twist. Nice touch, isn’t it? This is a vintage detail I picked up from that digital copy of the 1946 tailoring book I told you about! When the back lining is all put together, you can see how the center back lining pleat works and the location of my two sets of decorative cross stitching. 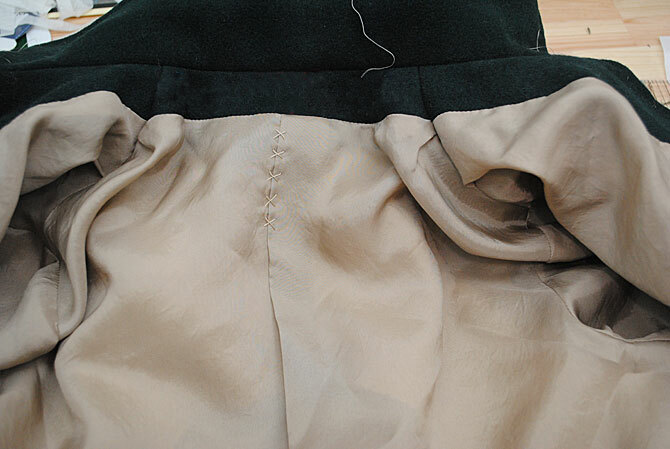 The center of the pleat is not sewn shut. With the facings attached to their respective lining pieces, I sewed it all together. Same routine of pinning first, then hand basting. I actually had to rip out the junction between the front and back facings at least twice to get everything lined up juuuuust so, but in the end it looks great! With the front and back done, I moved to the sleeves next. Remember the vent at the bottom of my sleeve, that will lead into my cuff? I had to do that in the lining too. And I basted the patch to the inside with silk thread until it gets sewn to the fashion fabric later on. Sewn all together, it makes this billowy, kind of funny looking mess! 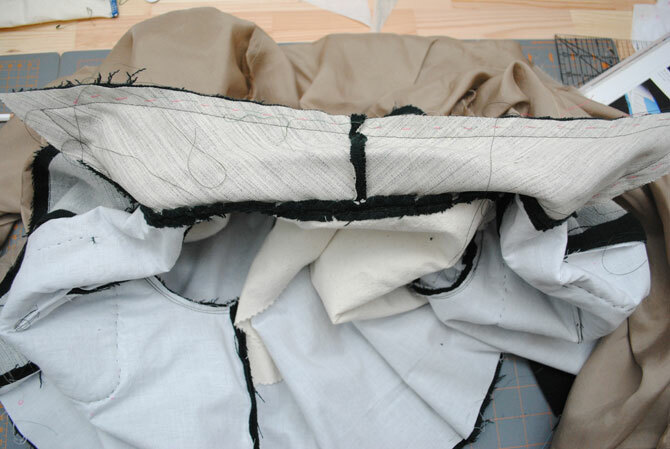 Before sewing it all together, I wanted to check to see if I needed to make any changes at the collar for turn of cloth. 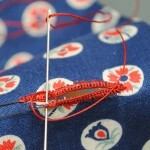 I first saw this tip on the Colette Anise sew-along, and followed Sarai’s procedure. 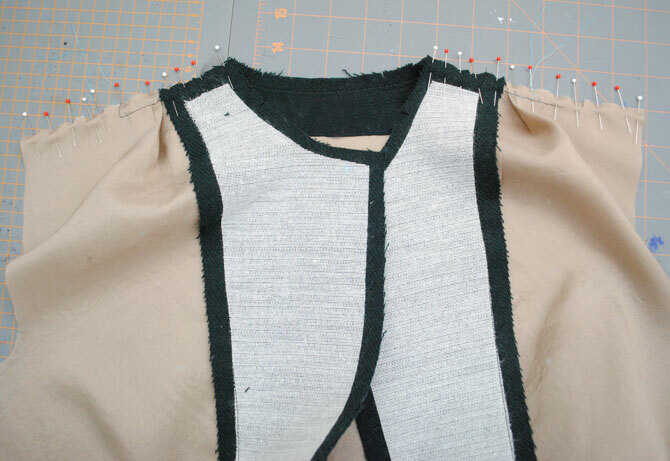 You pin the neckline with wrong sides together, then put it on a dress form (or have someone help you on your body). You would look at the back of the neck here, but I didn’t get a good photo of the pinning process so I’m showing you this below so you can see where I placed my pins. Looking at this blob below, it was hard to believe this was ever going to turn into a jacket. Even while I was sewing I felt that way. 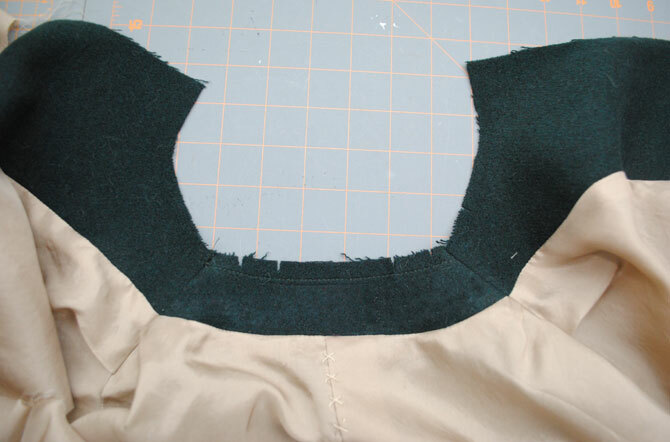 Below is (I think) after I’d sewn the collar together. 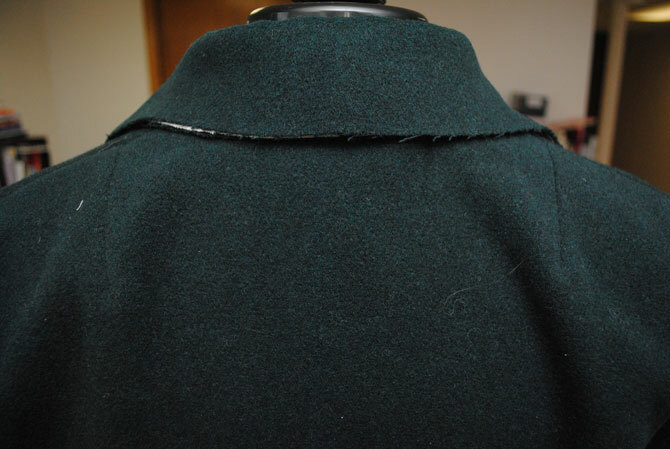 I sewed the collar, then up each side. 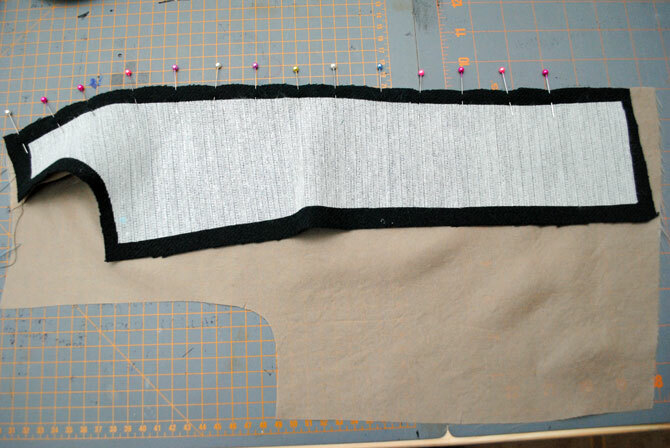 So that nightmare I mentioned was only a small portion of sewing the lining to the shell. Specifically it’s my personal hell that is the pivot point between the collar and the lapel. This is where not-pointy-enough-chalk and not-interfacing-the-seam-allowances and should-not-have-used-slippery-silk-thread-to-baste-my-underlining along with having about 5 too many thumbs all came together in the perfect storm. 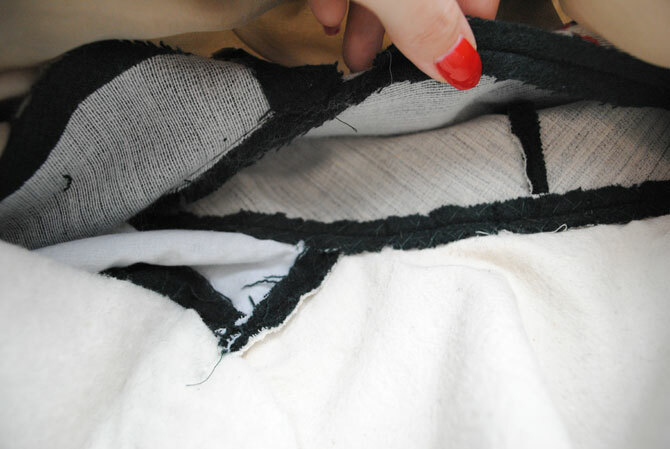 I had to rip out several times, my fabric started raveling… it was terrible. There were almost tears. There was definitely some shouting. And lots of swearing. And complaining on Instagram. And an email to my mom about how much I’d put into this project to have it all come down to, as I believe I put it (all caps, even), “TWO !#@#$^$ RIGHT ANGLE INTERSECTIONS”. And I show you this horrible photo only because I love you. This was midway through the madness. But in the end, I stepped away for the day and came back and figured a way to make it all work, more or less to my satisfaction. And here’s what it looked like once all the seams were trimmed. 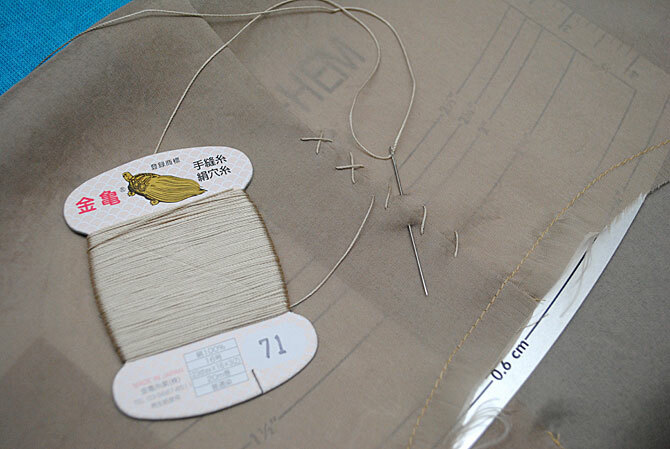 In tailoring, you baste the seams with silk thread before pressing. You slightly rolling the seam towards the inside so it doesn’t show. Here’s mid-baste. Then you press. And for my wool flannel with nap, this means crazy carefully. 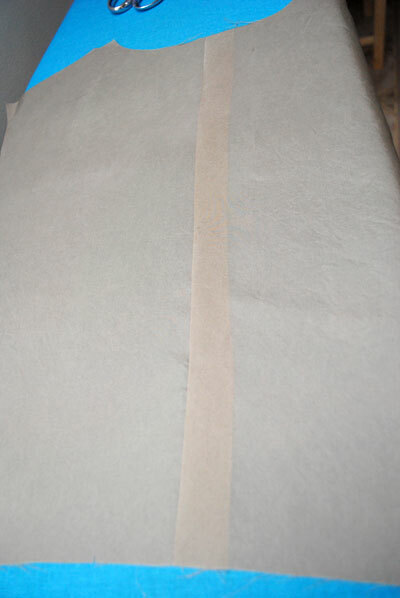 With some testing, I determined the best method for the seams was: lots of steam just above the fabric and over a thin cotton press cloth, then pressing just the edge of the seam with a clapper (AKA the bottom of my point presser). Let cool. And repeat once or twice as needed. 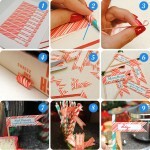 This is a time consuming process but absolutely necessary to get the desired result! I actually did this with a cup of tea sitting next to me, it took that long. I should point out here I opted not to tack the lining to the shell anywhere. 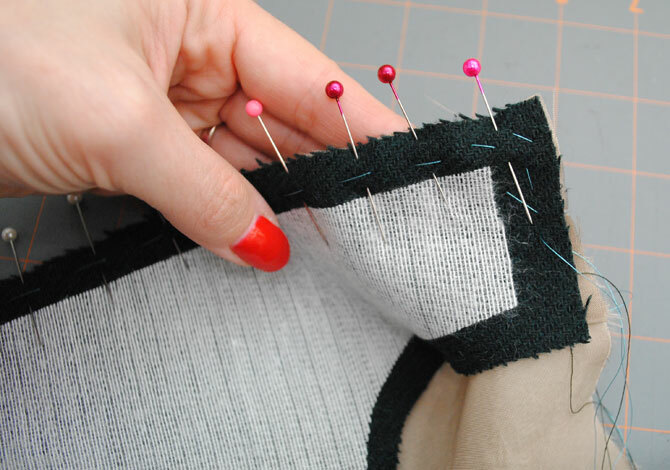 From everything I’ve read it seems there are a lot of ways you can do this… slip stitch the side seams together, do a French tack between the sleeve seam allowances to keep the sleeves from slipping, etc. Or you can just not do it at all. I tried the jacket on a bunch of times and just didn’t feel it was really necessary, so I didn’t do it. And now at this point, the only sewing left is the band at the bottom, and the cuffs! 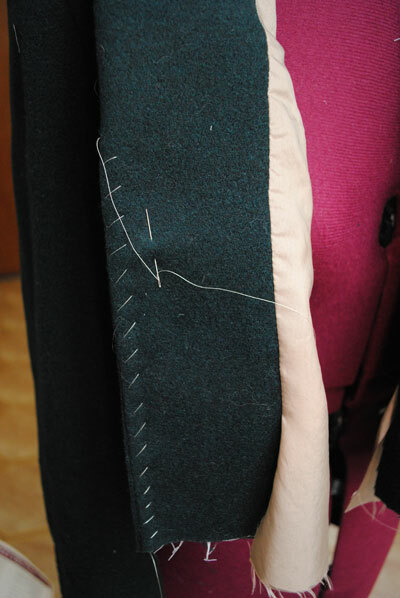 Oh, and then hand working the buttonholes. Look, it’s a lining in an almost-jacket! The pressing really seals the deal on those outside seams, doesn’t it? I’m going to press it all at least one more time at the end (and adjust the break point if needed, once the buttons are on). This is the point where I got really excited though, when I saw how it was coming together! The next post (and the last one before the reveal) will be much shorter, as I wrap up just the cuffs, bands and buttonholes. And I’m thinking about doing a final post after the reveal on what I’ve learned to do (and not do). 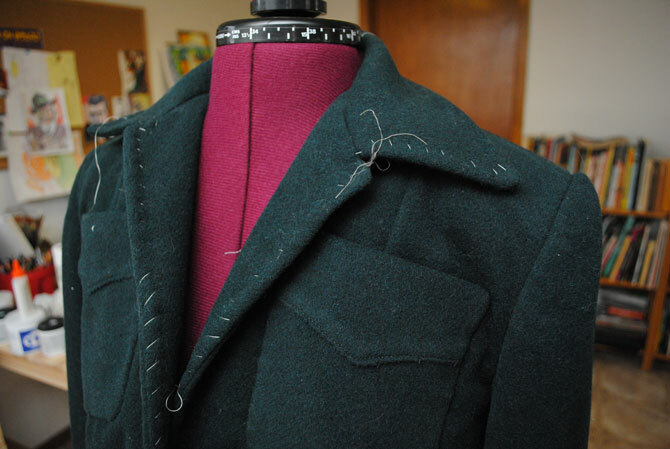 Stay tuned for more as my 40s jacket project draws to a close just in the nick of time! wow wow wow! 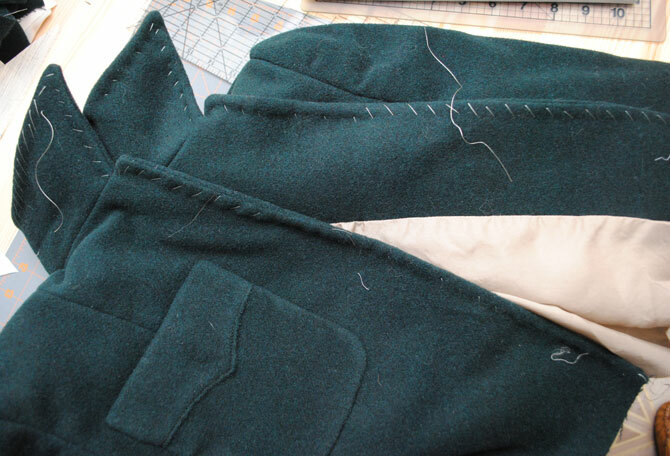 You are so meticulous but it is paying off, I really admire how you’ve tackled this project I’ve sewn for years and have yet to tackle a lined tailored jacket it inspires me! 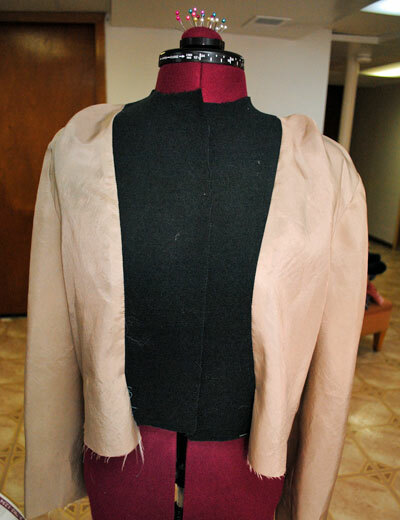 Oh my gosh, this coat is turning out so amazing! Oh my. The amount of work going into this is amazing. I thoroughly enjoyed reading about everything you have done. It is looking fantastic and I really hope that you enjoy the finished article. Looking forward to see the result! It looks promising! Holy cow, looking amazing!!! A jacket like this is one you’ll wear non-stop so it’s well worth all of the extra effort. Well done!! Ooooh it’s looking really good! 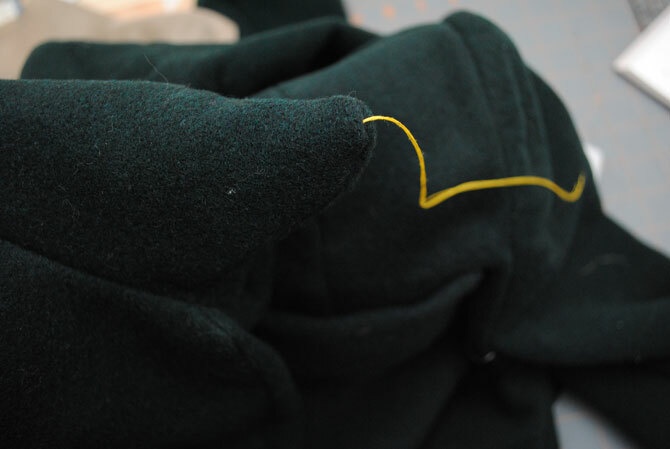 So sorry about the un-interfaced seam allowances. 🙁 I feel partly responsible since I told you to omit those. I always do since it always reduces the bulk in the seam allowances. But what a struggle you must have had with those fraying edges. I feel like you have the fun parts left: the bands and the buttons. 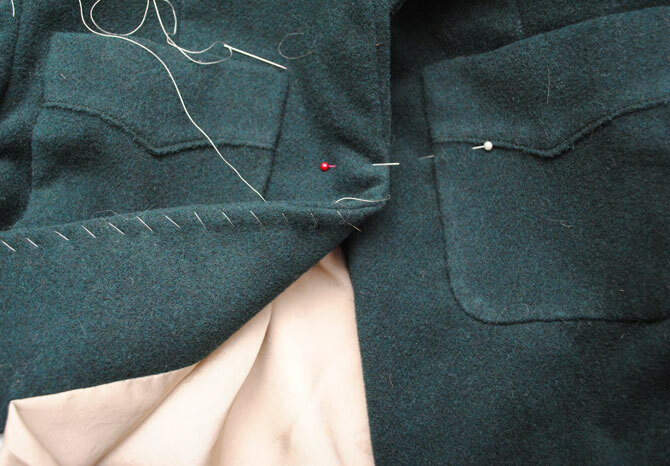 I don’t exactly thing the buttonholes themselves are fun, but it’s great when it all comes together. I love the way the jacket is turning out, and also the level of detail in your posts about it! I bet I’ll come back to this when I finally get around to making my own jacket (which I was supposed to do this summer, but I have so much else to do it’ll probably get done next spring). LOVING the detailed posts! I also sat down with a cup of tea, to read through three posts in a row. 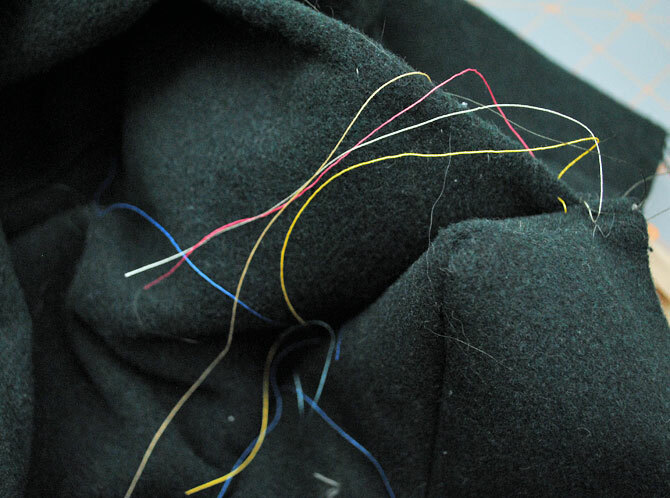 I feel almost like i’ve sewn the jacket myself! Great work, can’t wait to see it all done and dusted. Just frikkin amazing! Your work is beautiful and an informational public service to everyone. So very generous, thank you. it really looks lovely Tasha, I can’t wait to see it on you! Wow, this ist going to be a great jacket. Thank you very much for you very detailed post. Can’t wait to see it finished! And I love those cross stitches on the back pleat. I will keep that in mind when I’ll come to line my 40ies coat I’m working on. I just reached the same point tonight on my jacket (different pattern, refashioned to be 1913 appropriate), my tailoring isn’t quite as good as yours, but it’s the first time I’ve done any tailoring at all! Normally I throw some fusible interfacing at it and I’m done, lol. Right now my jacket is hanging for 24 hours to let the lining settle, then I’ll be getting onto trimming the lining as I know it’s too long, and then attaching it at the hems. What a fantastic post! I love the detail in your description and can’t wait to see the finished article. Although I am many, many garments away from a tailored jacket, your blog has given me the aspiration to make one (in a few years time). You are an inspiration. You gave me an aha! moment!! 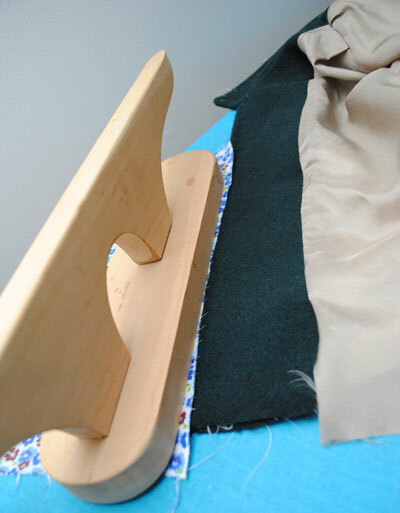 It just clicked for me that the thing I’ve been doing on my dress shirt collar is the same as turn-of-cloth! Thanks for that! Your jacket is looking absolutely fantastic! I’m so excited to see the whole thing completed! Thanks Gail! And I’m so glad to hear it clicked, always such a nice feeling when that happens, isn’t it! 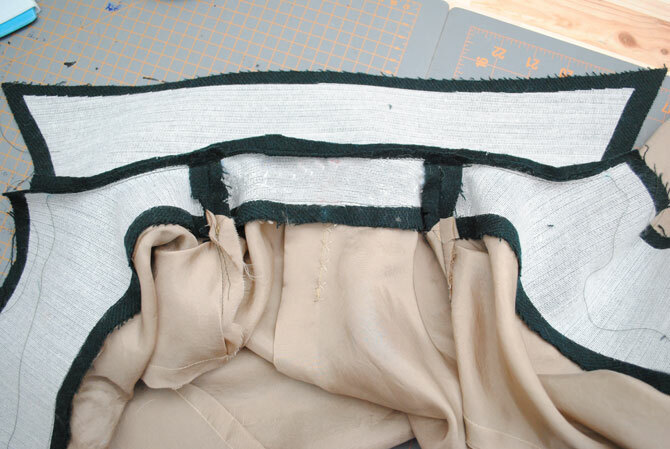 I’m so glad people like you have the patience and fortitude to do this kind of sewing; it looks amazing already! I am THE laziest and if I can’t get a project finished in a day or two, I give up. 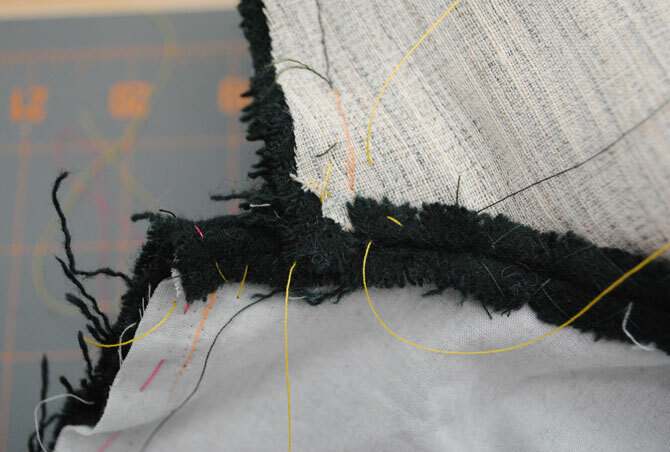 Thank you for sharing all of the techniques you use and letting us see behind the seams! Holy moly all the time and detail you’ve put into this is truly amazing! It’s going to be so worth it in the end. I wish I had that kind of patience. OMG, that looks amazing! 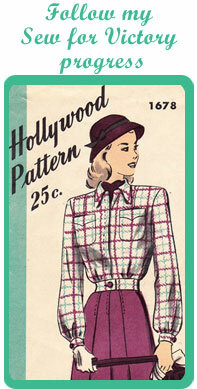 I have always loved those shirt jacket thingys perfect for wearing with “Hepburn” trousers. About pressing it one more time, won’t that be harder to do once the buttons are on and in the way? I figure I’ll likely give the seams the final press just after I do the buttonholes (so I can press them too), and then before attaching the buttons. So when the buttons are on, it’s done done done! It looks so good! 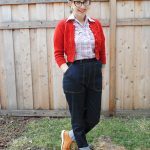 I’m doing the sew for victory challenge too. I’m so excited to see yours finished! I can’t wait to see this all finished, Tasha I’m sure it will be worth the tears and swearing!! Very inspiring!